Did you know… The Great North Air Ambulance need to raise £4.5m a year to keep their three helicopters flying in Cumbria, the North-East and North Yorkshire and without the support of volunteers, charity events, donations and sponsors this would not be possible. At Lake District Hotels we aim to do our bit to raise money for this particular charity, by hosting various events, raffles and throughout 2015 we ran a photo competition, which offered one of our guests the chance to win a two night stay in one of our hotels. With the aim of the competition to find the best photographs from the Northern Lake District to produce a Lake District Hotels 2016 calendar. The calendars were sold in the run up to Christmas with £2 of each sale being donated, we’d like to say a BIG thank you to everyone that purchased one of these calendars, which has helped to raise a total of £500 for the Great North Air Ambulance. 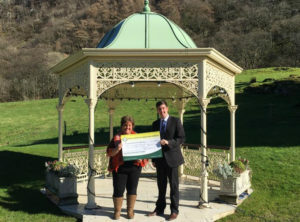 Beverley Kelso (Reservations Manager for Lake District Hotels Ltd and Volunteer for the Great North Air Ambulance) accepted the cheque from Tom Cobley Assistant Manager at the Lodore Falls Hotel. Bev has a strong connection to the Great North Air Ambulance after her youngest daughter; Alex was flown to Preston hospital following an accident on the side of Ullswater in December 2012. Beverley said, “The Great North Air Ambulance mean everything to us, the time they saved flying Alex to hospital saved her life. Alex underwent chest and head surgery, she amazed everyone; the doctors called her a “Christmas Miracle”.